Coreopsis gigantea (Giant Coreopsis) in center, yellow flowers, grows and blooms Winter to Spring, goes dry/dead looking Summer into Fall. Malacothrix incana (aka, Dune-delion) the grey-leaved yellow leaved aster/'daisy' nearer to ground level on both sides of the Coreopsis... Abronia Maritima, another type of Sand Verbena, is the purple-magenta flowered, green leaved groundcover surrounding them, and going up the slope; this species being the regional native closest in character appearance to iceplant, though only well adapted to sandy or loose sandy-ish soils. Also, in the front center of the photograph is some Carpobrotus, the common roadside/invasive iceplant from South Africa. 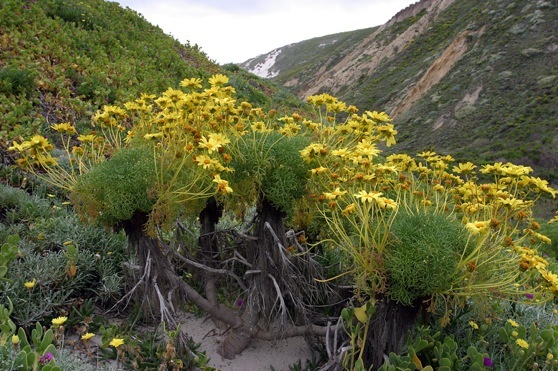 The three natives in the photo are also native to some coastal areas of the SoCaL mainland. Photo Steve Matson.